Have you or a loved one been the victim of medical malpractice committed by a hospital or physician? Errors committed by physicians or any hospital employee can lead to serious injuries, with potentially catastrophic outcomes. 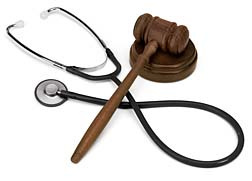 The field of medical malpractice is extremely complex in nature. For that reason, it is crucial that you retain an attorney well-versed in the representation of malpractice victims. The White Plains medical malpractice attorneys at Worby Groner Edelman LLP represent clients injured by doctors, hospitals, or other healthcare professionals. Cases involving surgical errors, or a failure to diagnose cancer, or any disease, can result in serious consequences for the victim. In these types of cases it is always necessary to prove that the surgical error was not an accepted risk of the particular procedure, or that a correct diagnosis in a more timely manner would have prevented a cancerous condition from becoming worse. Not every bad surgical outcome is the result of medical malpractice, and not every failure to diagnose a condition is the result of medical malpractice. This is also the case in instances involving obstetrical malpractice. Mistakes committed by a doctor or other medical professional during the delivery process can have devastating consequences, but not every terrible consequence is the result of malpractice. The question is, how do you tell the difference between a real malpractice case and a case that sounds meritorious but really is defensible? At Worby Groner Edelman, we have the resources to obtain all of your medical records, and to retain prominent medical experts to review those records to determine whether malpractice was committed. It’s crucial to retain experts who are able to stand up to vigorous cross-examination at the time of trial. Try and retain an attorney as soon as you are able to do so; while the Statute of Limitations in a medical malpractice case is usually two years and six months, in a case against a municipal hospital, you will have as little as ninety days to make a claim. In some cases, a Court can permit a longer period of time, but that depends upon the specific facts of a particular case; obviously, it is always preferable to satisfy the actual deadline. Cases involving a wrongful death have a two year Statute of Limitations. The White Plains medical malpractice attorneys at Worby Groner Edelman will handle all aspects of the case, including the appointment of an estate representative in a case involving wrongful death. We’ll also handle all post settlement work to secure Court approval to settle the matter. Cases involving infants (any child under the age of 18) require Court approval to settle. We also handle all aspects of the Infant’s Compromise Proceeding. Medical malpractice cases are fiercely defended by doctors’ and hospitals’ insurance companies, and by the attorneys retained to represent them. Even if a case ultimately settles, it will be vigorously litigated at the outset. The medical malpractice attorneys at Worby Groner Edelman LLP have many years of experience. We’ll process your case in a prompt manner, prepare the case for trial, and if necessary, take your case to trial. We’ll be with you every step of the way. You or a loved one has already been injured. We can answer your questions, and handle all of the details. Contact the White Plains medical malpractice attorneys at Worby Groner Edelman for a free consultation. We will evaluate your case free of charge, and we don’t charge a fee unless we are successful.